This continuing education course and exam will help personal trainers assist their breast cancer recovery clients in building confidence and regaining function through specific exercises and individualized program design. Describe breast cancer and its treatment. Articulate the anatomy of the breast. Explain the side effects of cancer treatments. Summarize the research on physical activity and breast cancer. Develop an exercise program using the ACSM Exercise Guidelines for Cancer Survivors. Describe precautionary situations and reasons to terminate exercise. Identify exercises appropriate for breast cancer survivors. List professional responsibilities for working with breast cancer survivors. 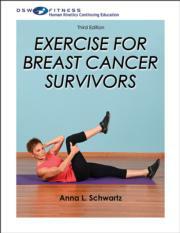 Exercise for Breast Cancer Survivors, Third Edition, will enable you to help your clients build confidence and regain function through specific exercises and individualized programs offered under your care.